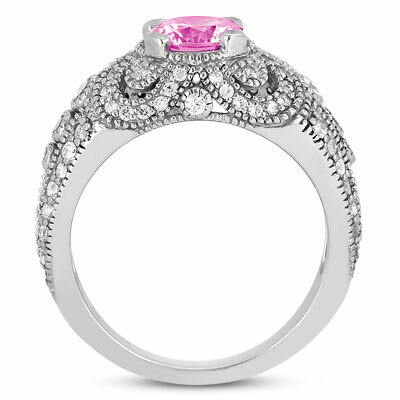 This 14K white gold vintage style pink topaz and diamond engagement ring has a bold yet feminine personality as it celebrates the beauty of the past, while interpreting it in daring, modern fashion. 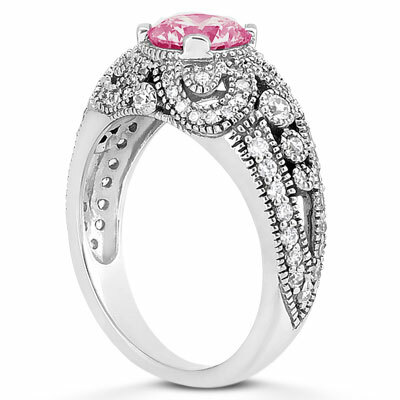 A striking 5mm round pink topaz instantly draws eyes as the focal point of this piece, while over 60 round accent diamonds, offset by elegant beaded edges, add sparkle to every visible side. This vintage 14K white gold ring overflows with both timeless glamour and modern sophistication. 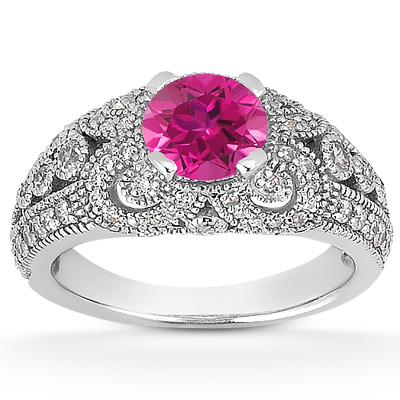 A candy pink topaz is surrounded by 64 accent diamond in the vintage 14K white gold setting. We guarantee our Vintage Style Pink Topaz and Diamond Engagement Ring to be high quality, authentic jewelry, as described above.